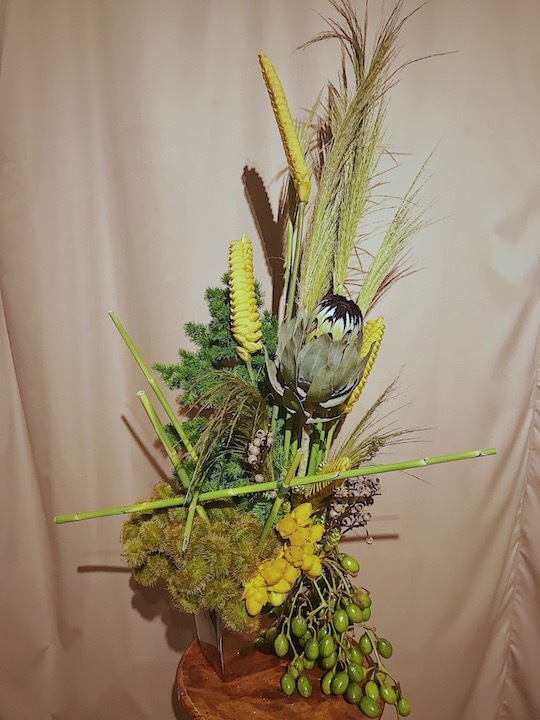 If you look on Instagram, you’ll find that floral arrangements have evolved from the studied, hyper-ordered model. 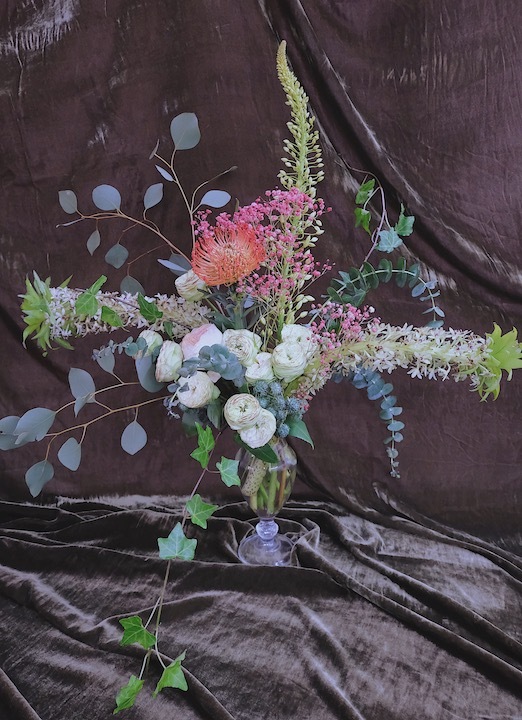 From tightly-gathered rosebuds for a wedding to manicured tablescapes, now the trend pendulum has swung in the opposite direction, with loosely-assembled blooms that look as though they were gathered in some field by a woman in a floor-length dress and a loose bun. Basically: Elizabeth Bennet putting together a floral arrangement while Colin Firth, in a soaking wet shirt, watches her. Akong Gugma has perfected that aesthetic. Not so much the wet Mr. Darcy, but the seemingly unstudied arrangements that feel at home in a palatial space or a small, rustic setting. Their name, Akong Gugma, is an old song by Ruben Tagalog. “It also sounds like a forbidden fruit so old only natives know of it,” says Aram Loe. 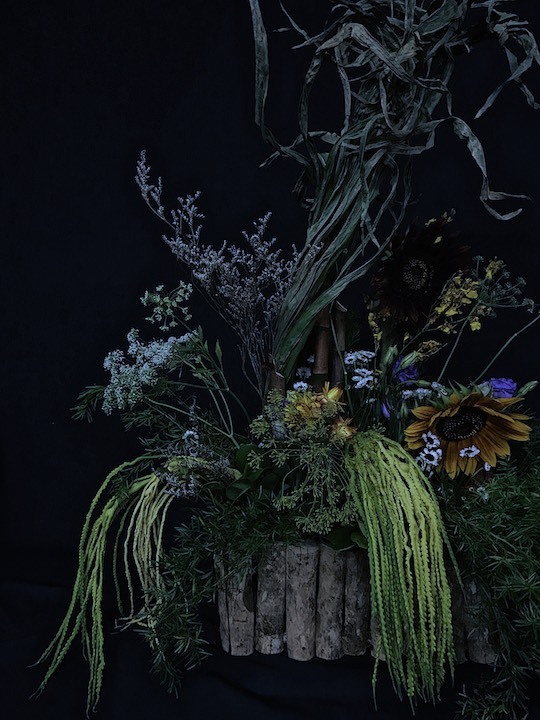 An extension of Rabbithole Creatives, a production and event styling team led by Aram Loe, Geoff Gonzales, and Darryl Recina, Akong Gugma has crafted unorthodox wedding bouquets for their prenuptial shoots. Bridal bouquet sits perfectly in a crystal urn. Consisting of Bangkok roses, pine flowers, vines, and varied eucalyptus. 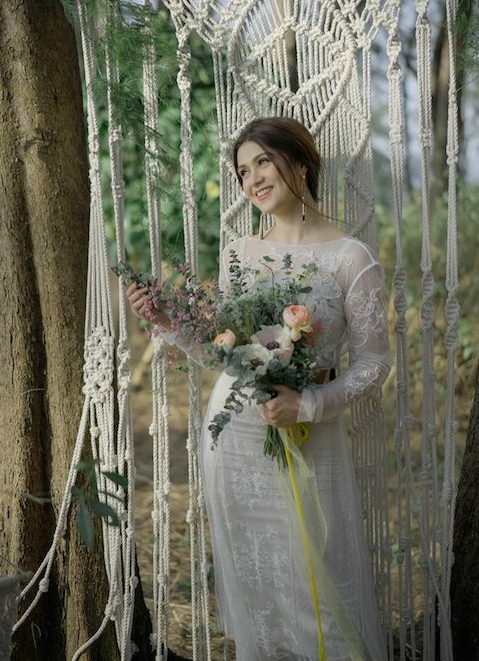 Carla Abellana holding our bouquet of Anemone, silver dollar eucalyptus and garden roses. Private Commission for Cecile Van Straten. Composing nature into a sculptural form. Queen Protea gingerly perched on top of local berries. Floralscape in a wooden vessel, private commission. 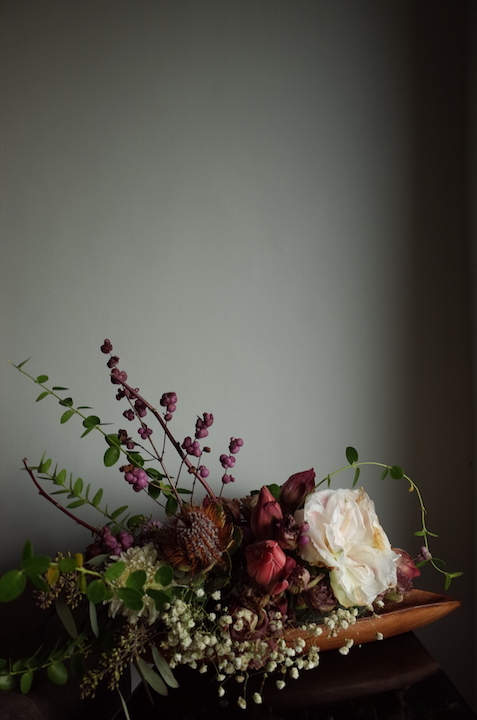 Mix of dried and fresh blooms, letting the eye travel with lines inspired by Ikebana. Not cookie cutter, but individual floralscapes in vessels to highlight the user’s style and way of life. “Restrained and considered composition” is what they call it. Though they’ve made a name for themselves in the bridal scene, they also do private commissions for homes, parties or gifts. 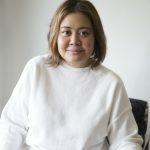 Their work retails for P4,500 for a capiz trunk vase (12x7x9 inches), P3,500 for a wooden cage (13x6x8 inches) and P2,000 for a variable size petite vase (4.5×3.5×4.5 inches). You can reach Akong Gugma at 0917-5122072.